While most of us barely move our gear - even to dust - because we are and always will be committed bedroom DJ's, there are some amongst us that are brave souls and venture out into the big wide world armed with vinyl and other assorted gear and play out. Of course, they need something to put their beloved equipment in - so why not choose the Magma Noisy Stylus Battle bag. So that was Messe 2005. Considerably more exciting than PLASA 2004 but I couldn't comment about Winter NAMM as the Atlantic Ocean and my bank balance stopped me going. As we're all aware, Stanton's range is undergoing a complete overhaul. After some serious industrial redesigning, the bulk of the new range is ready for action. A large proportion of it is brand spanking new (entire new range of turntables and CD decks) plus a handful of new club mixers, whereas a lesser proportion has been cosmetically updated to fall in line with the new Stanton stylings. Back on day 1 of MusikMesse, we spent a considerable amount of time the the good people from Urei, as well as getting up close and personal with the 1601 and 1610S model scratch mixers. Of particular interest is the sampler in the S model and of course, we got a demo movie. "Hold these... stand there... and smile... "
...were the words nobody wanted to hear. Whether they were comfortable doing it or not, various names from different spheres of the community were herded sheepdog style into formation and made to grimace for my camera. As ever, Slikmats came through with the goods in the shape of V2 Pro mats. Big up to Gaz. Another year, another show. One company that really seems to be raising it's game is Gemini. Show after show, their presence increases, as does the volume of news heading our way. It's fair to say that these guys really are trying to shake off the old slightly dodgy image of yesteryear. Having already covered the NUO5 with a review and posted info on the NUO2 and 3 in a previous new story, I was also keen to see the new NUO4 in action. Little information was available prior to MusikMesse other than being a cut down NUO4 but with midi. But we managed to get an overview movie (in progress) from Ecler and some pictures as well. For us old school heads, Hijack represented the pinnacle of the UK scene. This was not only due to the dope rhyme skills, but also to the deck skills of DJ Supreme. Such is Supreme's reputation in the tablist scene, he was featured in Scratchcon 2000 with massive respect from the assembled scratch DJ crowd. In testament to the man's rep, a documentary has been made - Turntable Trixters - due for release in July 2005. While you all wait for me and NdB to pull our fingers out and give you more MusikMesse news and footage, why don't I offer up some of the booty we gathered on our trip. Rafik from German crew Lordz of Fitness has created some new battle wax called "sucker punchin'". Lots of dirty electronic beats and sounds, plus some more musical elements as well. For your chance to win one of the three copies, click here and send the mail. Winners will be picked on 29th April (that's 2 weeks away). Now we've all seen Final Scratch and Serato - indeed we've covered them extensively in a group test. On the outer edges of the same field are Ms Pinky, Mixvibes, PCDJ etc. But making a big splash at MusikMesse this year was Alcatech's Digiscratch v2. First reported just over a year ago, Alcatech have gone all out to let everyone know that Digiscratch is here. And why not - running on their Digiscratch or BPM studio software and utilising hardware made by RME, they quite rightly have enough to shout about. And indeed they did in a demo movie we took. 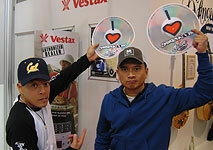 A year ago at MusikMesse , we saw MixVibes DVS for the first time. We had a play, liked what we saw and expected big things. On delivery of a copy, NdB and ProfBX both had serious issues getting it to work at all - and reading a review in a magazine in the UK substantiated our feeling that it was a good attempt but wasn't ready for market. Numark - 5000fx, TTX and iPod mixer? A fairly small and quiet stand for Numark (apart from Rockid cutting up a storm on the CDX's and the 3 channel DXM09). But the 5000fx mixer finally made a showing - proving it's not just myth and legend. And we got a TTX update plus a tantalising glimpse at an iPod mixer prototype. Life often throws up fortunate accidents - one such event was the discovery of the new d.2 battle mixer while on the hunt for another Mackie product (that we didn't find). Oh no - not another damn scratch mixer I hear you cry. But this one has at least one wow factor - the inclusion of firewire, plus the inclusion of a new optical Infinium crossfader. UPDATE:Although you can't see it in the pics, there's a hole in the faceplate (masked by the fader knob) - the Infinium fader is tension adjustable. Ok people - we're back, tired and have a shedload of stuff to write up, pictures to download and video to work on. It'll all be trickled through rather than one big lump of verbage so that each topic can be discussed - and it give us a chance to try and remember the blur (especially day 3) that was MusikMesse 2005. To come over the coming days: Mackie, Numark, Gemini, Ecler, Mixvibes, Digiscratch, Stanton plus movies from QBert, Noisy Stylus, Netik, Skilz, and some of Birdy Nam Nam. And of course we've got some booty to pass on as well, including the slikmats that Yoga and Q are mugging with - signed by both of them. A couple of weeks ago, I was told that there was a strong chance that Rodec's Scratchbox would make it's first public appearance and we weren't disappointed. A quick update to progress on day 1. Vestax show off 2 differents QFO colours, wow audiences with the STC-V1 guitarish table and Urei bowl me over with the sampling abilities on it's new 1601s mixer. It's that time of year again - when pretty much every music manufacturer from around the world box up their new gear and ship it to Frankfurt for the MusikMesse. And of course, myself and NdB will be boxed up and shipped to Frankfurt as well. Armed with several unfeasible small and expensive gadgets - and more compact flash space and mini DV tape than is healthy, We're hoping to capture every important event and lump of gear that you guys might be interested in. I'm certainly aware of a few things that I know you'll want to see (no hints though!). Pioneer DJM-700... or is it? Over the next few days, the site will become v2. I might take the site down from time to time to put the new things in place.